Norway's Statoil is a major oil company in Scandinavia and they have many petrol stations in Denmark. 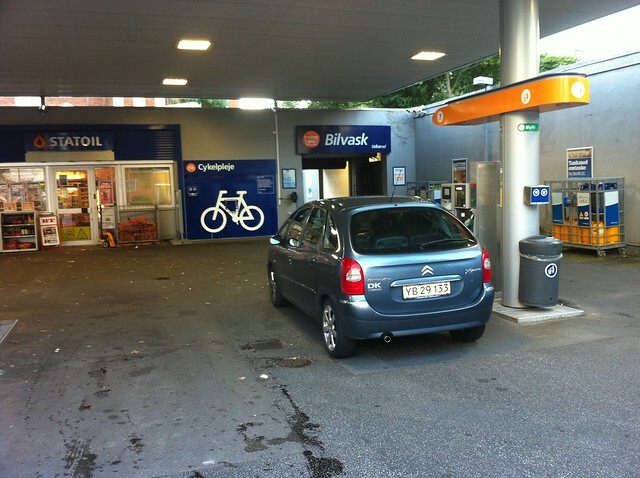 My friend Mads took these photos of a Statoil station in Copenhagen that has clearly accepted - dare one say embraced - the bicycle culture here in the City of Cyclists. 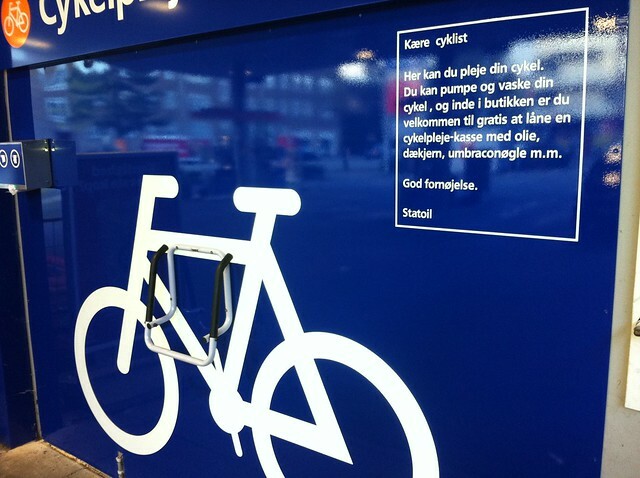 In no uncertain terms Statoil has reserved space for cyclists to fix, tune-up or pump their bicycles at this Bicycle Care station. You can care for your bicycle here. You can pump and wash your bicycle and, inside the shop, you're welcome to borrow a free bicycle care kit with oil, tire levers, allen keys, etc. I simply don't know how to make that text any nicer. 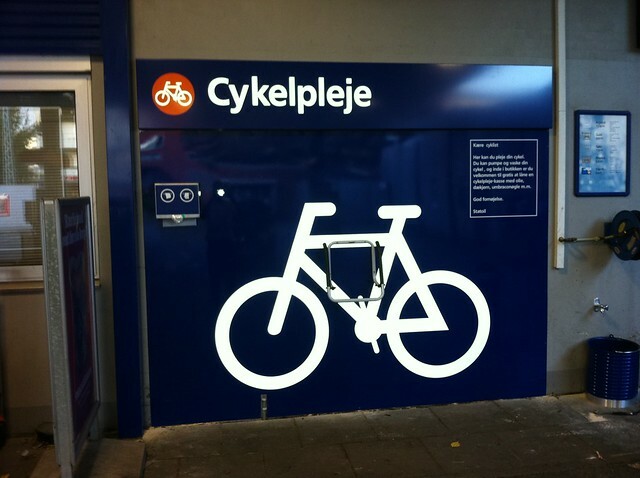 In the centre of the bicycle pictogram is a rack that folds down so you can hang your bicycle on it while repairing, caring, whatever. An air hose is on the right and, on the left, a dispenser with paper towels and plastic gloves. Here's the view of the station. The bicycle symbol is prominent and quite splendid. That's all it takes. That section of wall was unused but now it is useful. A modest investment and, in a flash, this station is bicycle friendly. If the Citizen Cyclist also drops a few coins in the shop, that's good for business, too, but the important thing is symbolism. Especially near the centre of Copenhagen where bicycles outnumber cars.